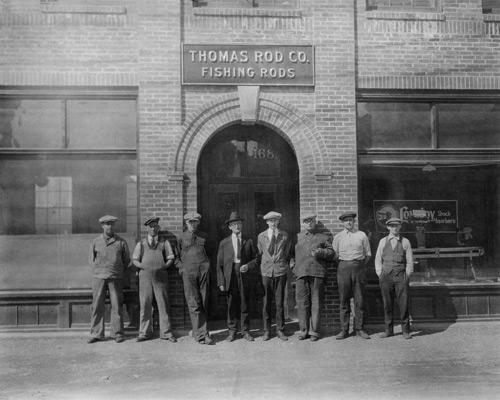 Welcome to the Thomas Rod Company! the tradition that Fred and Leon Thomas started over 100 years ago. The Thomas Special, and Thomas Browntone. Please click on our other links for more information on ordering a new Thomas rod, or our vintage rods. Thomas Rod Co. logo hats and shirts are now available! Go to our "Accessories" page for more details. The Thomas Rod Co. is also a dealer of fine accessories from the House of Hardy, and Cortland Line Co. We also sell quality vintage tackle. Trade-ins of vintage rods, reels, and high quality guitars are considered on a case by case basis. Contact us for details. (207)659-3270 or email: [email protected].